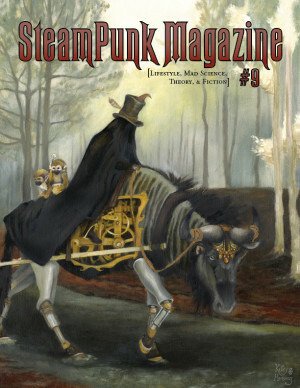 Steampunk Magazine » Release Party at Steampunk World’s Fair! Release Party at Steampunk World’s Fair! Will you be at Steampunk World’s Fair in a few weeks? We will be, and we’re throwing a release party for our new issue! Join us for a surrealist-themed shindig with parlor games and silent films, 10pm-midnight on Saturday in the Centennial Room at the Embassy Hotel. Oh I wish I could be there! Is there a monthly subscription offer at a discount for purchasing 12 months or more? We don’t currently offer a subscription because we publish pretty irregularly, so we can’t guarantee the number of issues we’d be able to get out to you in a year. Thank you for your interest!